Talk to your kids about reading Durkheim. Sure it starts with a little dabbling in "totems" and "piacular rites." But that's just a gateway. Before you know it, they've slid right into the morass of "collective effervescence." Once that happens, no amount of Weberian theory will save them. Disenchantment. Oh disenchantment. 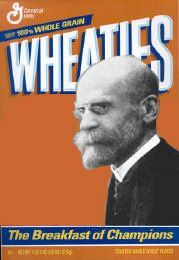 As a religious studies professor, I am a skilled Durkheim dealer. "Hey kid, here's a copy of Elementary Forms of Religious Life. Try it. Don't you want to be cool?" OK, that's not exactly how it works. I usually start by talking about sports. That sets the hook. Indeed, I recently wrote about this for the American Academy of Religion's "Spotlight on Teaching" section. My initial reading of Émile Durkheim's Elementary Forms of Religious Life left me neither enlightened nor inspired, but rather profoundly confused. The principal barrier was my own limited understanding of the category of religion, which started and stopped with "a belief in God or gods." But slowly, the French sociologist's ideas on religion and society sunk in—that is, with a little help from college football. I was living in Tallahassee at the time, home of the Florida State Seminoles. In shifting my gaze from Durkheim to game day, I witnessed a community of similarly dressed football devotees, unified in their ritual behaviors, and intensely loyal to their symbolic universe. From players and coaches to fans and the media, there was a grand sense of "us," not to mention a dehumanized "them" in the form of visiting teams. I discovered firsthand that critics could also become a "them." When I started asking impolite questions about the Seminole mascot—or "symbol," as they prefer to call it—I was met with an assortment of hostile responses. No doubt, I was treading on sacred territory. As I learned more about the foundation and frontiers of religious studies, I simultaneously continued translating these ideas through the lens of athletics. To be clear, I am not partial to the "sport is a religion" trope. Such arguments, in my mind, stretch the categories of religion and sports to unrecognizable lengths. Instead, to channel David Chidester, I prefer to examine the ways in which sports operate in "characteristically religious ways." That is, I prefer to apply the tools of religious studies to athletic activities that participants and observers deem to be special, set apart. The Pittsburgh Steelers, for example, are not in my view a religion in western Pennsylvania. But I do notice a history of complex social forces producing an air of sacredness around the "Terrible Towel." One finds this ordinary piece of yellow cloth waved at games, hung in sports bars, wrapped around newborn infants, and rested atop the coffins of departed fans. For "Steelers Nation," this ordinary towel is an extraordinary marker of their corporate identity. So from my earliest exposure to religious studies to the present, athletics has been part of my comprehension process. Drawing directly on this experience, my "Religion and Sports in America" class is also—in an almost surreptitious way—an introduction to the study of religion. First, I lure students in by promising to talk about sports. Then, before they know it, they’re using terms like "collective effervescence" to describe sports fandom. This article is one of a collection of pieces on teaching religion by using sports, yoga, and dance. Check it out. This is an excellent resource for anyone interested in teaching on these topics. At the very least, you'll get some new ideas on peddling Durkheim.